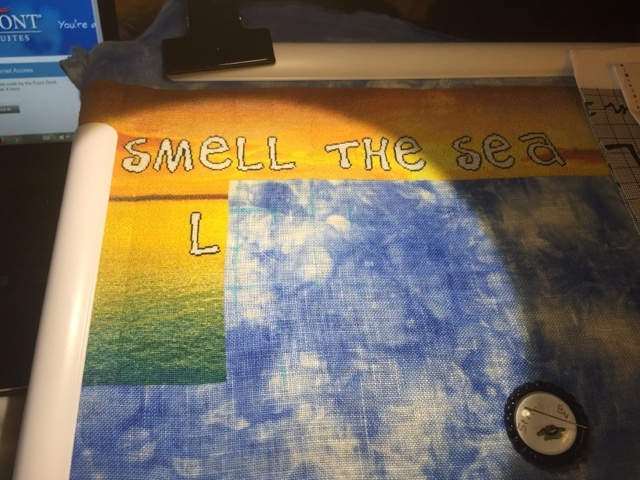 Fantasy Cross Stitch: SFS August Report and a Page Finish! Hello again! I've had another good month with SFS and haven't spent anything. That will probably change next month as I'm starting to run short on some colors of floss. But my big excitement for this post is that I finished my next page. Technically it's two pages since I didn't count them before but I'm so excited it seems like it took forever! I love how this page turned out though. It's still going to be a while before that third line comes in but hey it means more ocean to enjoy :). Non stitchy wise we're still in hotels. We're waiting to hear back from a couple of places hubby interviewed at. But tomorrow starts my last week at work and he's put in his 2 week notice so we are planning on starting our cross-country trek on the 30th. We're going from here and staying the night in New Orleans which is one of my favorite cities. Then we're going to San Antonio and spending a day at Seaworld since we get in free. We'll stay the night there and our next stop will be Phoenix. He went to college there so we will see some friends. And then we'll arrive in SoCal which is where we're living. I know a couple of weeks ago Sandy mentioned a stitching group that meets and if love more info about it but you're a no reply blogger. Can you email me your email address. hreneeby@gmail.com. Thanks! Thanks for stopping by my little corner of the world. Please send some good juju our way that hubby gets a job. See you all next time when we're on the road! On how many count do you stitch it ? Why did you choose that blue fabric ? Thanks :). I will especially of New Orleans! Your sea is looking awesome! The cross country trip sounds like a blast. I love traveling. Good luck with the job hunt. We are currently going through that as well. I quit my night shift job last week and am looking for a day job. My Husband isn't getting many hours at His current job and has an interview next week that could turn into a great job (so great that I won't have to work LOL). Wish us luck too. Woo! Hooo! Congrats on your page finish!!!! Awesome progress, Heather! Good luck to hubby with the job. Sounds like you have a fun itinerary planned; great way to make the move fun! Fantastic progress, Heather and all the best for your DH to get a new job. Very nice progress on your huge piece. I hope that everything goes well for you and your husband and that he will find a job. I'll keep my fingers crossed for you. Congrats on the progress and nothing but good juju from here (although New Orleans might mess with your positive juju quota, or at least it does with me!). Fingers crossed you have a safe trip west and hubby gets a job quickly! Great progress too. 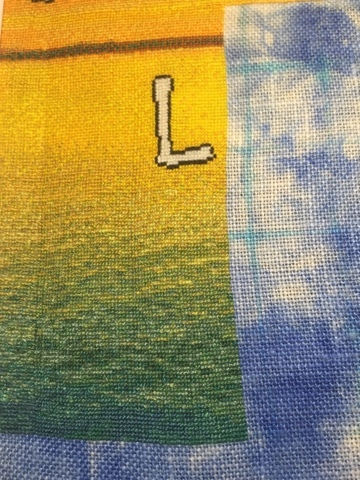 Your stitching is beautiful, and I would love to see the entire picture. Hope your husband finds a job. 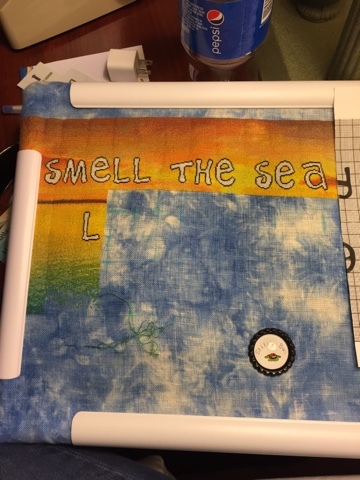 This is looking so good - I love the fabbie you are using. Oooh I'm late but hopefully you're enjoying your trek 'cross country and are taking a ton of pictures! :D I'm sure you'll be glad to stop living out of suitcases and stitchy tubs haha. Finally caught up. Your piece is just amazing. Congrats on getting where you are!! I wish your hubby all the luck in the world finding the right fit and something that makes him happy! !